24 cm x, 625 p. : ill. This book of edited chapters helps researchers from clinical and nonclinical disciplines plan, carry out, and analyze research, and evaluate the quality of research studies. 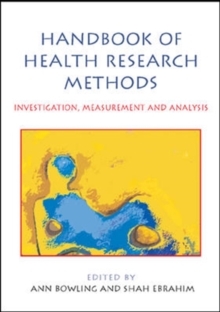 The focus of the book is a multidisciplinary approach to research methods that are relevant to researchers from different disciplines working side by side in the investigation of population health, the evaluation of health care, and health care delivery.